The Minnesota Breastfeeding Coalition has received a grant from the U.S. Department of Health and Human Services Health Resources and Services Administration (HRSA) to implement the Business Case for Breastfeeding (BCFB). See samples of what has been done with some of our mini grant funds! Becker County Community Health, awarded $2,000 with another $1,340 in-kind funds provided. See how Becker achieved their goal! From Becker County Community Health: “Our goal was to have a permanent lactation room available, and increase employees’ knowledge of the importance of lactation and the benefits not only to the families but also to the business as a whole. We did elicit support from stakeholders, including human services director, Nancy Nelson, who was instrumental and bringing these goals to fruition. Our first possible designated area did not comply as it possibly obstructed roof access. The room that was designated will be dual purpose. The room is available for lactation, and is also used by Children and Family Services to investigate and video-tape maltreatment interviews. The room is more welcoming and comfortable to meet the needs of both groups. Input and suggestions were considered to meet Children’s Services’ needs. This included not having breastfeeding pictures and pamphlets out in the open. Our educational efforts will be in public areas, employee newsletters, and on a one-on-one basis. Breastfeeding information will be available in a basket that can be stored away during interviews. We continue to strive to use our lactation program and room as a model for other businesses in the rest of the county and community as we continue promoting Business Case for Breastfeeding. Le Sueur County Public Health, awarded $2,000 with another $1,000 in-kind funds provided. 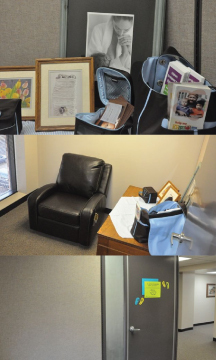 See how LSCPH created the space for their Lactation Room. See the Lactation Program policy LSCPH implemented.